All in all, good stuff! 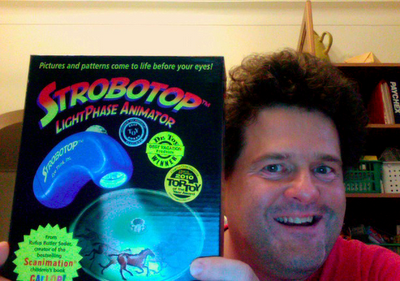 So head over to Amazon to get your own Strobotop to start playing around with. "Arduino" is the generic name for the open source microcontroller boards (plus the free software development environment) that lets anyone (really!) start experimenting with physical computing. I've just started to scratch the surface of all the possibilities of using Arduino in my own exhibits/design work, and I'm really finding it challenging and enjoyable in a good way. Basically Arduino lets you easily get computers to interact with the real world. You can use Arduino to make cool interactive objects that can sense inputs from switches, sensors, and computers, and then control motors, lights, and other physical outputs. Arduino has been a boon to artists, makers, and exhibits people in providing a way to (relatively) quickly and cheaply translate their creative ideas into the powerful world of physical computing. While there is a great deal of information and sharing about Arduino tools and techniques available online, for myself I also like to have a handy reference book or two nearby. And that's where the excellent Arduino Cookbook comes in. Written in a style that makes it accessible to both the Arduino expert and newbie alike, the Cookbook provides a great reference and road map for creating Arduino projects. I hope you have a chance to explore both the Strobotop, and the Arduino Cookbook. Have your own suggestions for cool stuff that you'd like to share? Let us know about them in the "Comments" Section below!